KUALA LUMPUR, 3 May 2018 – Three Universiti Teknologi Malaysia (UTM) Architecture students have won the prize of the PAM-ZSR Architecture Prize 2017. The winning students were Rashidah Jimi Sham, Wilson Tan Xern and Koh Jhee Son. Rashidah and Wilson Tan Xern both emerged Category 2 winners where each took home RM5,000.00 and a certificate. Another one, Koh Jhee Son emerged as a finalist and took home RM500.00 and a certificate. Photo of the three winners of UTM Architectural Students at the PAM-ZSR Architecture Prize 2017 after the prize awarding ceremony at Melawati Corporate Centre, Kuala Lumpur. Rashidah participated in the Dual Function Center for Flood, Relief and Mitigation project under the supervision of Assoc. Prof. Ramli Jamaluddin. Wilson competed in the High Water Research Center project under the supervision of Dr Lim Yaik Wah while Koh Jhe Son was involved in Rethink Social Housing under the supervision of Ar. Samsiah Abdullah. The PAM-ZSR Architecture Prize 2017 ceremony was held at Melawati Corporate Center, Melawati, Kuala Lumpur. 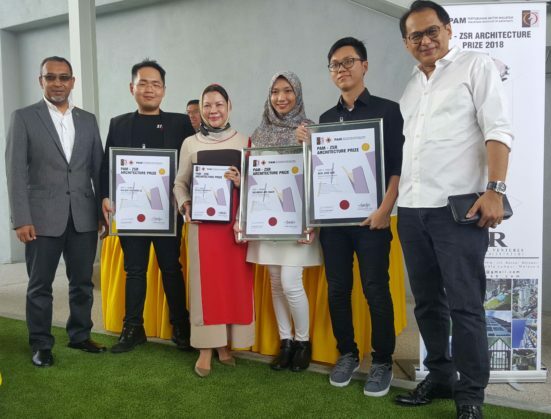 Ar Norzaini Mufti, Director of Z & SR Architectural Ventures Sdn Bhd and Ar Ezumi Harzani Ismail, President of the Association of Malaysian Architects handed over prizes to winners. A total of 65 entries were received from Public and Private Institutions of Higher Learning recognized by the Board of Architects Malaysia (LAM). Two categories have been contested based on two levels of competency, namely LAM Part 1 and LAM Part 2. Two of the Part 2 Category were won by UTM. Of the five Part 2 finalists, the winners were UTM (2) and University of Malaya (1). Of the nine Part 1 finalists, the winners were Taylor’s University (2), Tun Abdul Razak University (2) and Universiti Sains Malaysia (1). The panel of jury consisted of Ar Ezumi Harzani Ismail, Ar Mohd Helmi Md Hanif, Ar Adrianta Aziz, Prof Ar Dr Abdul Razak Sapian, Ar Amzar Ahmad, En Hizwani Hassan and Muhammad Firdaus Jamal. Selection criteria were based on attributes, design excellence, innovation, sustainability and build ability. The success of students speaks highly of the quality of architecture program and the dedication of academic staffs in Malaysia.